Naval Shipbuilding is a multi-billion dollar industry which deals with high-end and complex technology which demands high level of professional competence in Engineering and Management. Majority of the Naval Shipbuilding and Ship Refit programs have been affected by cost and schedule overruns due to various reasons, some of which shall be discussed in this article. A quick glance through the fact sheets of few of the prestigious Naval ship Building programs of major Naval powers, in some of the best shipyards across the globe, is sufficient to understand the gravity of this problem and its impact on the financial and military standings of the respective countries. Unlike Commercial Shipbuilding and Ship Refit which are structured and standardized to a great extent, the Naval Shipbuilding and Ship Refit programs on most of the occasions are highly ambitious and more often than not deals with the introduction of new designs and technologies. Naval programs which are characterized by complex systems to cater for the challenging mission requirements coupled with a cost and schedule budget with little margin for error, increases the risk of cost and schedule overruns , especially in the case of first-in-class vessels of the program, which in turn may induce overruns due to knock on effect on the budget of follow on ships. Design Finalization: Most of the ShipBuilding contracts are finalized without freezing the final design. Due to the typical nature of the industry, it normally takes a decade or more to develop a new class of ship from concept design to the delivery. This long duration of the Shipbuilding program makes it almost impossible to finalize on the technologies to be used as the life cycle of the technologies are much shorter. 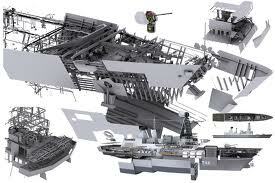 Therefore it becomes necessary to finalize the shipbuilding contract without detailed design. Moreover the detailed design process itself is a time-consuming and cost intensive activity which forces the concerned parties to conclude the contracts without investing on detailed design. This leads to formulation of contracts which are not very well-defined and which in turn leads to poor cost and time management as the program progresses. This ambiguity in the design of the ship is one of the major factors of cost and schedule overrun and therefore effort should be made to firm up the design, at the earliest, to the best possible extend with adequate provision for technological conversions. Contracts and Cost Estimate: Normally there are two major types of contracts which are practiced in shipbuilding industry – Fixed Price Contracts and Cost Reimbursement Contracts. Provisions for conditional penalties for delay are incorporated in both the types of contract. In the case of Fixed Price Contracts, which are normally used for the follow on ships, the price is finalized and agreed by the ship builder and the client, and in the event of cost exceeding the agreed value; the additional cost is borne by the builder, unless the reason for it is attributable to the requirements of the client. In the case of Cost Reimbursement Contracts, which are normally used for the first-in-class ships, provision exists for the client to pay for all the additional expenses for completing the program, if the ship builder could justify the costs incurred. Both the types of contracts sometimes include an incentive scheme which acts as a basis to control the cost and profit and encourage the shipbuilder and the client to perform their role more efficiently. 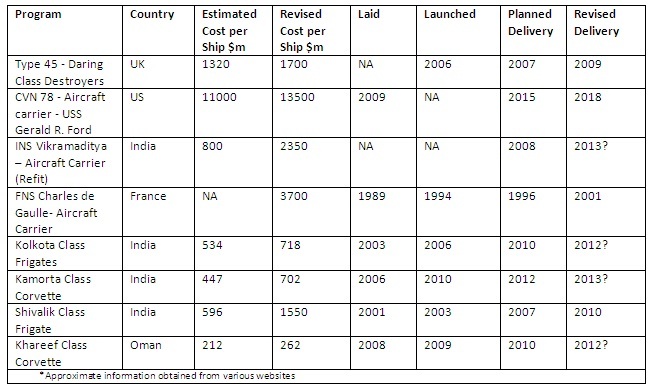 As these contracts are based on the estimated costs, the accuracy of the estimate plays a major role in determining the probability of occurrence of any cost overruns. The terms and conditions handling any cost and schedule overruns must be well-defined in the contract for the benefit of all the stakeholders and to ensure the success of the program. Complexity of the Systems: Highly advanced and complex systems chosen for Combat Management and Platform Management onboard often tend to increase the risk of Cost and Schedule overrun. The probabilities of occurrence of such overruns are at the maximum if the systems being selected are in the development stages. While such advanced systems under development are required to be chosen on some occasions to meet the mission capabilities of the vessel, adequate risk mitigation plans together with necessary provisions to meet any contingencies must be incorporated in the program. Labor and Material Costs: The cost of labor and material for shipbuilding and ship repair constitutes a major portion of the program cost. The shipbuilding programs are normally spread across many years and therefore the effect of any escalation on the quantity of labor required or the increase in the cost of material pose a significant risk of cost and schedule overruns. The additional requirement of labor which may delay the project arises due to the rework s caused by immature design. Cost may also increase due to the overhead expenses such as the yard’s operational expenses which increase with the increase in duration of the program. Engineering Changes: Major and Minor Engineering Changes warranted by regulations, or those initiated by the yard on its own initiative or the ones carried out due to client requirement, are found to be one of the major causes of the schedule delays. While the cost aspect is taken care in most of the cases, the amount of labor and time required to implement the changes may force a change in the program schedule resulting in the delayed delivery of the vessel. Customer Factor: A demanding customer who always look for more value at no extra is a major cause for the scope creep which can result in cost and schedule overruns. Good communication and understanding with the customer is necessary for the smooth progress of the project. For example the cooperation of the customer is necessary for timely completion of the inspection activities and it is expected that the customer nominates competent personnel for such activities in time. At the same time the yard must provide all the required information towards this in advance to the customer in order to ensure that he comes prepared for the tests and trials. Delivery of Materials and Services: The delay in delivery of the Materials and Services may cause schedule overrun in Ship building projects which can indirectly lead to the escalation of overall cost. For example the delay in delivery of the Engines could hold up the progress of structural work which may have a knock on effect on the other scheduled tasks. Similarly the delay caused due to the poor services provided by an incompetent sub-contractor can lead to quality issues delaying the acceptance of the vessel and thereby causing a schedule overrun for the entire program. Project Management: Poor Project Management not only damages the reputation of the shipbuilder but also causes significant cost and schedule overruns. It is therefore very important for the Project Manager to understand the factors responsible for the overruns and adequate measures should be implemented proactively to avoid any cost escalation or schedule delay. Funding Issues: Naval Shipbuilding and Ship Refit programs are mostly very expensive evolutions with a duration spread across many years and costing millions of dollars to the state. Due to this reason the funds for the program are allocated in the budget by the governments of the respective navies in parts which are associated with various milestones of the program. Due to factors such as recession and economic crisis, which are now a common phenomenon in the world economy, the governments may be forced to restrict the funds for certain programs to meet other urgent requirements, thereby leading to a schedule overrun. Technology Transfer: In the modern era of ship building, most of the navies are promoting indigenization which has led to the formation of strategic partnerships between the shipyards across the world. Such a partnership demands the transfer of technology which needs to be carried out in a controlled manner based on well-defined procedures. Poorly controlled transfer procedures and lack of cooperation among the participating yards during various stages of the project may lead to cost escalation and unwanted delay in the completion of the shipbuilding program. These are only few of the several factors which lead to Cost and Schedule overruns in Shipbuilding and Ship Refit programs. The very nature of the warship building program and its complexity makes it more prone to the risk of such overruns. All shipbuilding and ship refit programs demands high level of professional competence and strict project management. Overruns have happened in projects executed by the best of the yards for the best of the navies in spite of their vast experience and domain knowledge. Efforts should be made to identify well in advance the risk factors which can lead to cost and schedule overruns and have efficient plans in place to mitigate them. In addition, efficient project management practices are to be adopted to guarantee sufficient control of the cost and schedule at all stages of Shipbuilding or Ship Refit.